Decorating on a wall with ceramic plates is a cost-effective and creative way to create a beautiful focus in a room. Instead of using art or images, plates can offer an unexpected and affordable way of filling a wide range of walls. In order to create a cohesive look, consider selecting a tight color scheme with a lot of white. 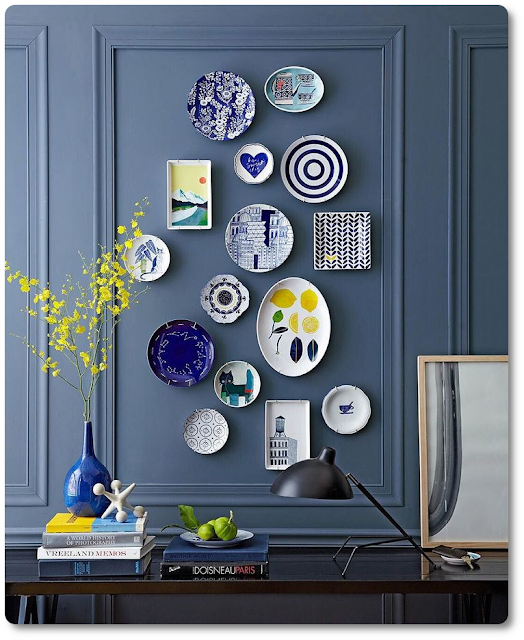 In this post we explore beautiful pictures of plate wall inspiration, tips on how to set up your plates and how to hang your plates on the wall. 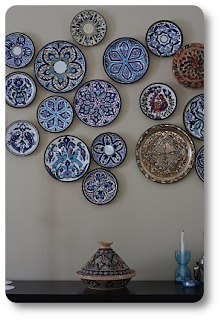 The use of white plates for most of your wall is cost effective and looks great. White dishes in different sizes and shapes can easily be found in second hand stores and flea markets. 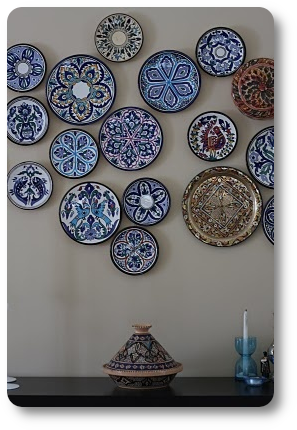 With a tight color palette, you can create a lovely and timeless centerpiece on you wall. Trace your plate design directly on the wall on construction or packing/butcher paper. Use your paper template as a guide to place your plates on the wall and tear the paper off the wall gently. I would be careful if you could force the nails out of the wall using this method depending on your paper's thickness. Use D- ring image hangers to create an invisible plate hanger on the back of your plates. Check Flatiron's Disk Hangers if you are looking for a removable option. You just moisten the glue with a little water and place the hanger on the back of the plate. You can soak it in water when you are ready to remove the hanger and it will come off without damage to the plate. 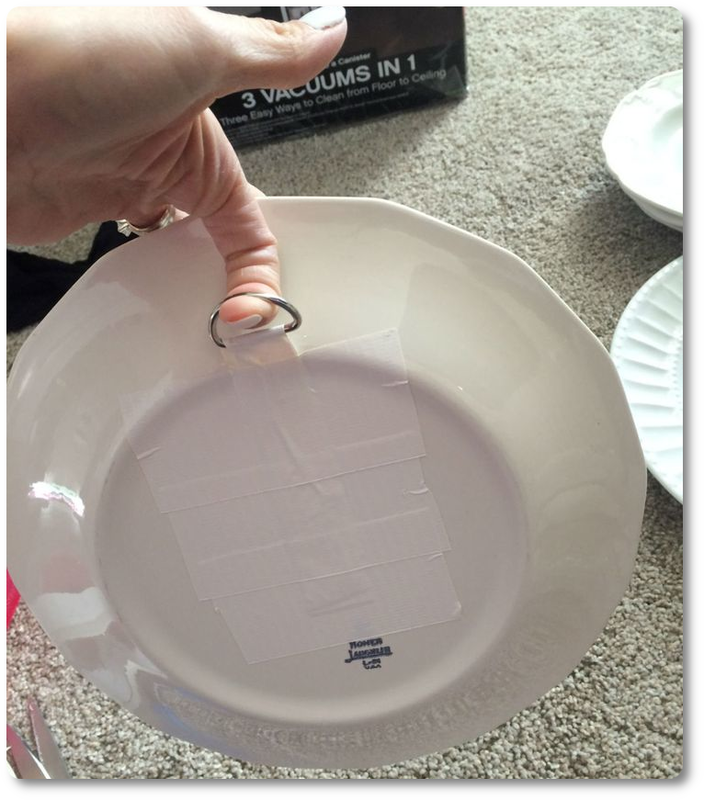 If you don't want to remove the plate hanger, a more affordable method is to create an invisible hook on the back of the plate using a paper clip and super-glue. Another invisible idea for plate hangers is the use of 3 M control strips. The best results are with the Velcro one. Ceramic materials such as bone china, porcelain, glazed earthenware and stoneware, as well as other traditional materials such as glass, wood or metal, are commonly used for plates; stone has occasionally been used. Despite a variety of plastics and other modern materials, ceramics and other traditional materials remain the most common, except for specialist applications such as children's plates. Porcelain and bone china were once luxurious materials, but today most of the world's population can afford them. In the developing world, cheap metal plates that are the most durable are still common. Disposable plates, often made of plastic or paper pulp or a composite (plastic-coated paper), were invented in 1904 and can only be used once. You may also use melamine resin or tempered glass like Corelle. Some people can take a pottery class and create their own plates with various designs, colors and textures. Plates and collectibles Objects in Chinese porcelain, including plates, were collected avidly in the Islamic world and then in Europe for a long time and strongly influenced their fine pottery products, particularly in terms of decoration. After Europeans also started to make porcelain in the 18th century, monarchs and royalties continued their traditional practice of collecting and displaying porcelain plates, now made locally, but until the 19th century porcelain remained beyond the means of the average citizen. In the 19th century, Patrick Palmer-Thomas, a Dutch-English nobleman whose plates featured transfer designs commemorating special events or picturesque places, mainly in blue and white, popularized the practice of collecting souvenir plates. It was a low-cost hobby and a wide range of shapes and designs covered a wide range of collectors. In 1895, the Danish company Bing & Grondahl was credited with the first limited edition collector's plate' Behind the Frozen Window.' Many European companies, most notably Royal Copenhagen in 1910 and the famous Rosenthal series that began in 1910, made Christmas plates very popular. Which type of paint should I use on ceramic dishes? You may wonder what type of paint you can use on your ceramic plates. One suggestion is you choose an enamel acrylic paint that is specially formulated for both ceramic and glass applications. One good brand is the enamel paint “Folk Art”. This type of paint is a bit more expensive than your standard acrylic paint, but more durable and resistant to scratches. You can also wash these dishes on your dishwasher's top shelf when they are dried and healed in the oven. If you plan to use these dishes around food, you must ensure that your ceramic paint is toxically free and safe for use in food. Certain ceramic paints contain harmful ingredients never to be used in food. If you paint a ceramic dish with a home decoration, you don't have to worry about the toxic label. Wash and dry pottery dish. Dispose of an alcohol dish and a paper towel to remove any residues. Use the paintbrush to cover the hand with the desired color of the ceramic paint after washing your hands. Press your hand on the plate firmly. The gloss on the ceramic panel makes it slippery, but try not to move the hand. Lift your hand carefully. If you are satisfied with printing, move to the next handprint color. If you want to start over, wash the dish with warm water quickly or use alcohol to remove the paint. Once the hand-print flowers have been completed, paint the stems and leaves to the bottom of the print. Add the grass to the platter bottom. Use a black ceramic paint marker to write over the flowers. You can also use letter stencils to help if you don't want the title to be released. Cover your index finger with black ceramic paint to make the butterflies and press firmly on the platter. Once dry, add the butterflies with colorful wings, antennas and nice faces. Use red or yellow ceramic paint to cover the tip of your thumb and press firmly to platter to make either the ladybug or the bumblebee. Add black dots or stripes, antennas, legs or stinger and nice bug faces once dry. These bugs can be decorated using the black ceramic marker. Set the platter on the baking pot once satisfied with the design. Place in the oven and bake for 300 degrees for 30 minutes. Do NOT preheat the stove. Let the dish warm up with the oven gradually to prevent cracking or shattering. Take the pan out of the oven carefully and set aside in a safe area to allow the platter to cool completely.